Rigid boxes are made of heavy duty paper board,it is the reason why rigid boxes are very strong--that will add more quality feeling.And rigid boxes have different wrapped paper,it is easy to create personalized looking,so rigid boxes are considered as high end packaging products. But rigid boxes need more space to store and more freight to transport. Now foldable rigid box combine the advantage of rigid box and folding box into one--foldable rigid box have collapsible construction,it is made of heavyweight paper board--the same material to build rigid box,and it have cut cut line at corners that can fold box into flat,with stickers,it is easy to assemble into rigid box when take off stickers. Those euro tote bags are made of wide range of super fine coated paper such as 157g art paper,170g art paper,200g art paper,230g art paper,210g card paper, with matt or glossy lamination,different handle such as rope handle die cut handle ribbon handle,with printed custom design--spot pantone color,solid pantone color,multi pantone colors,cmyk full color printing.coming in any size,shape. Every business do need shopping bags.When you are looking for shopping bags,carrier bags or promotional bags, you can choose paper bags. Paper bags are great as shopping bags,carrier bags,promotional bags.Paper bags are versatile enough,no matter what end you want, you can find right paper bags to meet your requirement. Laminated paper bags have glossy or matt lamination, laminated paper bags are made of super fine coated paper,all laminated bags have turn top and reinforced paper board, so laminated paper bags have strong construction,it is the advantage of laminated paper bags that their strong construction can add long lasting, and usually strong construction can also add more quality feeling.Another advantage of laminated paper bags is that those bags have the best printing result,because coated paper is great material to print any color,whether your art work is spot color,solid color,cmyk full color,pantone color,it is easy to print on coated paper perfectly then construct into bag.With custom printing,laminated paper bags are not only as high end shopping bags,carrier bags,but also as elegant advertisement to showcase business information and product image to more potential customers.Custom printed laminated paper bags can represent your business and products the best. This is laminated paper bag, it is made of 200g art paper, with matt lamination,cmyk full colors printing for custom logo on both sides of bag,ribbon handle knotted at top turn of bag with reinforced paper board. 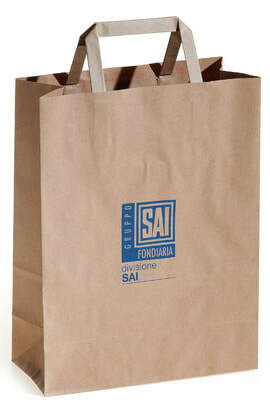 Laminated paper bags are great as high end shopper for any business. Because laminated shopping bags have strong construction,elegant looking,upscale feeling. Laminated shopping bags are made of super fine coated paper with glossy or matt lamination,so all laminated shopping bags look more elegant and luxurious than other shopping bags. And laminated shopping bags have turn top with reinforced paper board,so laminated shopping bags have strong construction, laminated shopping bags are strong for long lasting, and it is key point to construct bags with quality feel. SO when you are looking for luxurious shopper,laminated shopping bags are perfect choice. In fact there are so many choices for paper,handle and finishes to build laminated shopping bags,it is easy to build personalized,distinctive shopping bags as your desire. As laminated paper bags manufacturer,4GiftPack specialize in manufacturing and wholesale laminated shopping bags,laminated carrier bags,laminated luxury paper bags.Those laminated bags at 4GiftPack are hand made to ensure each one high quality ,and it means laminated shopping bags at 4GiftPack can come in any size,shape and quantity.We can print custom logo and full color custom design on laminated shopping bags.Short run is available,detail please contact with us. When you are looking for shopping bags,carrier bags or promotional bags, you can choose paper bags. You have so many choices. Paper bags are great as shopping bags,carrier bags,promotional bags.Paper bags are versatile enough to meet your end easily,no matter what end you want, you can find right paper bags to meet your requirement. Paper bags are made of different paper with various handle,finishes,color,they have so many variety including laminated paper bags,kraft paper bags.Laminated paper bags are favored by so many business because laminated paper bags are durable,strong,elegant,great as luxurious bags for any end. Laminated paper bags have glossy or matt lamination,they are made of super fine coated paper,all laminated paper bags have turn top and reinforced paper board, it is the advantage of laminated paper bags that they have strong construction for long lasting to add more quality feeling.Another advantage of laminated paper bags is that laminated paper bags have the best printing result,because coated paper is great for printing any color,whether your art work is spot color,solid color,cmyk full color,pantone color,it is easy to print on coated paper perfectly then construct into bag.With custom printing,laminated paper bags are not only as high end shopping bags,carrier bags,but also as elegant advertisement to showcase business information and product image to more potential customers.Custom printed laminated paper bags can represent your business and products the best. Hinged Lid Rigid Boxes With Printed Logo And Ribbon Closure. This is rigid box,it is made of heavyweight paper board,covered box by art paper with matt lamination,two colors printing for custom logo on top lid,hinged lid construction with ribbon closure,custom made foam insert. 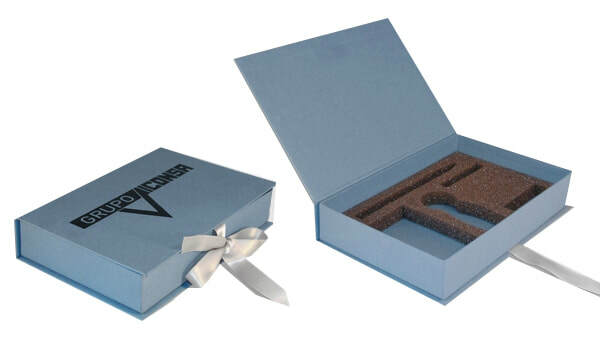 Rigid boxes are considered as high end packaging solution for high value products and gift items.Rigid boxes are made of heavyweight chip board,paper board ,it is the reason why rigid boxes have very strong construction, and strong construction can protect inside packaging as well as add more quality confidence into inside packaged. 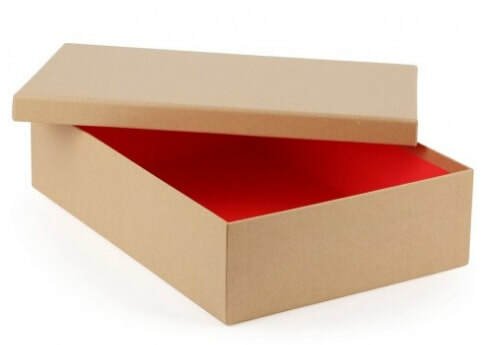 1 Material: all rigid boxes are made of recyclable chipboard,paper board,weight of chipboard and paper board range from 800g to 3000g,so all rigid boxes have strong construction. 2 Wrapped Paper: wrapped paper options included art paper,kraft paper,white kraft paper,foil paper,special paper with elegant texture. 5 Size: all rigid boxes at 4GiftPack can be customized coming in any size,shape. 6 Quantity: there is no minimum order quantity,short run is available. When you are looking for rigid boxes,contact with us. Cheap price,high quality,fast turnaround are our advantages. Flat Handle Brown Paper Bags With Logo. This is brown kraft paper bag, it is made of 120g brown kraft paper,with flat paper handle,one color printing for custom logo on both sides of bag. Brown paper bags are 100% recyclable,they are great as eco friendly shopping bags and carrier bags.Brown paper bags are favored by so many business,because they are not only as green shopper,but also as economic shopping bags. Brown kraft paper is sturdy enough,even just with 100g brown kraft paper glued with flat paper handle, it is easy to build brown paper bags to fit any end.